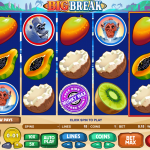 Big Break is a video slot coming from Microgaming which is the perfect game to play in the hot summer months. The slot reels are set on a beautiful beach with cold waves splashing on each spin. But believe it or not the beach is overcrowded by surfers, so it might be hard to find a free space to lay down your towels. This wouldn’t be so surprising if the surfers weren’t Monkeys. That’s right, who knew that our ape friends had a thing for the beach and surfing altogether. This is an attractive slot with interesting visual details and intriguing bonus features which is sure to catch your attention. The first detail you will notice in the slot are the two Wild symbols. The Lucky Break Wild lands on reel 5 only and will substitute for winning combinations formed from right to left. The Big Break Wild can land on all reels and will substitute only for the high paying Monkey symbols. If you land 3, 4 or 5 scatters on the screen you will get 15 free spins which can be re-triggered. During the free spins bonus in Big Break all of the Monkey symbols will pay left to right as Scatter symbols. If you manage to land all of the five Monkey symbols on the reels you will trigger the Surf’s Up Bonus. Here you need to pick your favorite surfer and you can win up to 50 x stake. 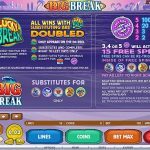 Big Break is an interesting slot with a very unusual game theme. The designers from Microgaming were very innovative when they designed this game, especially with the bonus features. The game is sure to catch your attention and leave you craving for the beach in the hot summer months. If you’re a globetrotter then you should consider playing Around The World a 5 reel slot by MicroGaming.